We were happy to get a visit from Clerise du Plessis of Swartland Municipality who delivered the registration certificates of Riverlands and Chatsworth Path onto Prosperity Centres. The Centres were registered with the Department of Social Development and now complies with health and safety, fire safety and children’s safety and well-being requirements according to the Children’s Act and other relevant legislation. 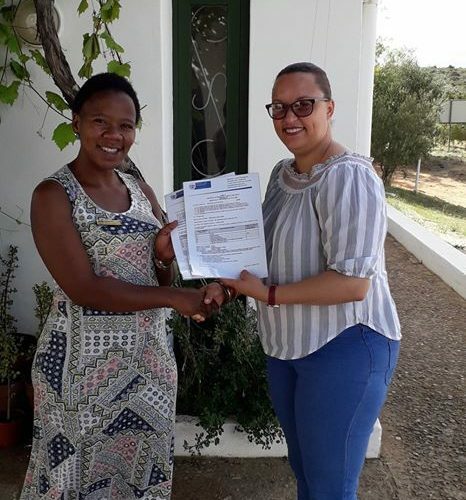 On the picture below is Nomasande Caleni from Goedgedacht Trust on the left who worked hard to get all requirements in place and on the right is Clerise du Plessis.